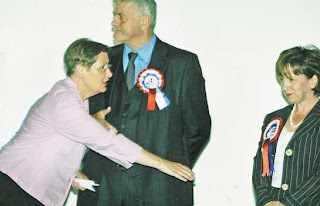 Sinn Fein's Bairbre de Brun, reaching out to shake the hand of Diane Dodds of the DUP after the European election results were announced. Ms de Brun received the highest number of votes, with Mrs Dodds the 3rd highest and moving from DUP poll toppers to DUP elected didnt reach the quota. Its a sad indictment of Mrs Dodds that she did not have the manners nor the political nous to recognise what another own goal such a snub would deliver.